Turning points in a financial system usually occur in discrete phases. At first, new information that contradicts existing preconceptions is dismissed as unimportant. But as more such data accumulates, a growing number of people come to expect the new trend to continue. In economist-speak, “expectations” change, and these become self-fulfilling prophecies, as people start behaving in ways that anticipate — and thus cause — more of the same. Inflation is a classic example. When the cost of most things has been flat for a long time, a few scattered price increases don’t change any minds. But when lots of things start costing more, everyone eventually decides that prices are rising generally and begin buying in anticipation, whatever the current price, which in turn causes prices to rise even faster. This kind of data-driven perceptual shift is now occurring in a lot of different places. In US housing, Reuters just conducted a poll of property market analysts to see what they think home prices will do in coming years. Turns out – not really surprising given the recent surge back to 2006 bubble levels – that they expect home prices to outpace both overall inflation and wage growth for at least the next few years. An acute shortage of affordable homes in the United States will continue over the coming year, according to a majority of property market analysts polled by Reuters, driving prices up faster than inflation and wage growth. After losing over a third of their value a decade ago, which led to the financial crisis and a deep recession, U.S. house prices have regained those losses – led by a robust labor market that has fueled a pickup in economic activity and housing demand. US home prices and Japanese wages are of course two very different, seemingly unrelated indicators. But that’s what makes their simultaneous increase so telling. Easy money around the world is affecting different sectors in different ways. But more and more of them are starting to move in the same direction. As the “prices are rising” signals become louder, more people will stop seeing each as a one-off event and start viewing them as confirmation of a broader trend. 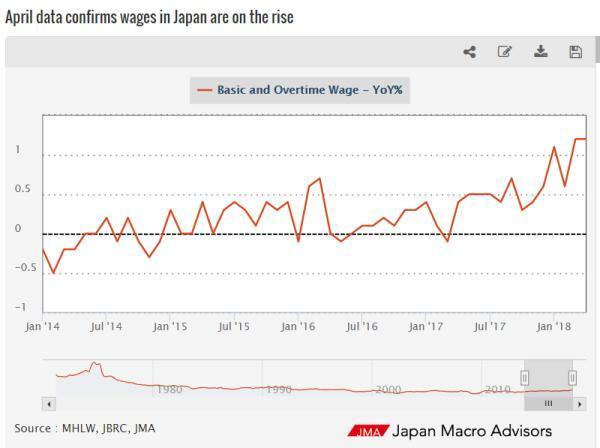 Let Japanese wages stay on the current trajectory for just a little while longer and the Bank of Japan will probably follow. Which leads to a classic tightening cycle with bubbles bursting all over the place.